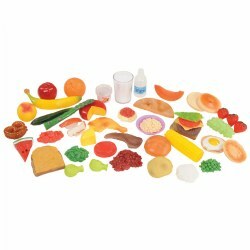 Find various sets of pretend food for the classroom's kitchen unit. 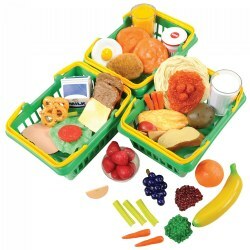 Kaplan includes breakfast, lunch, dinner, and dessert sets, as well as healthy food sets to promote good eating habits. Kaplan also provides food from other cultures, to help expose new food to picky eaters. 3 years & up. Pieces connect with hook and loop fasteners so children can "slice" them with a plastic knife and cutting board included in the set. Corncob measures 4 1/2"L. Cutting board measures 6"L x 3 3/4"W. 23 piece set. 2 years & up. The perfect healthy addition to a pretend picnic or any occasion. The watermelon boat makes the perfect bowl for a delicious fruit salad. Fill with pineapple rings, berry clusters, strawberries, kiwi, and orange slices and serve in big purple bowls for a rainbow of juicy goodness. Set of 18 includes three each of berry clusters, strawberries, kiwi slices, and orange slices, two pineapple rings, two serving bowls, serving spoon, and watermelon boat measuring approximately 8"L x 3"H.
2 years & up. Green Beans, tomatoes, yellow squash, and carrots are the high-quality wooden vegetables that can be harvested and placed in the textured, woven basket with handles. 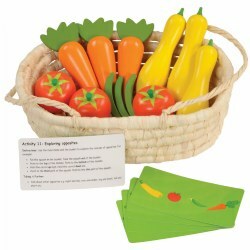 The set includes a harvest basket with 12 green beans, 2 tomatoes, 3 yellow squash, and 3 carrots for a total of 20 colorful, delicious vegetables. Also includes 20 activity cards. 3 years & up. Buy all your favorite fruits and vegetables at the farmer's market by the bushel full! 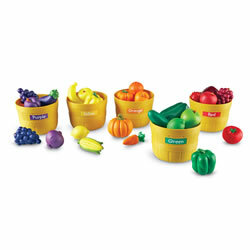 Includes 5 sorting baskets and a rich variety of colorful fruits and vegetables. 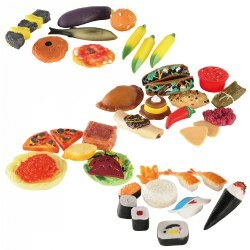 Reinforces healthy food choices, color recognition and sorting skills. 3 years & up. 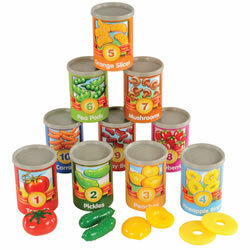 Includes 55 plastic fruits and vegetables in 10 durable cardboard cans with lids. Great addition to a kitchen pantry. Cans are labeled with numeral, word and pictures to reinforce early math and vocabulary skills. Includes Activity Guide. Each can measures 4 1/4" H x 3" in diameter. 3 years & up. 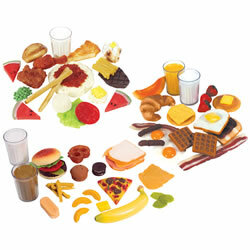 Promote healthy eating habits with this 48 piece set of realistic foods and drinks. Children can prepare a complete meal or an afternoon snack with the fruits, vegetables, breads, meat and dairy products as well as healthy drinks. 3 years & up. 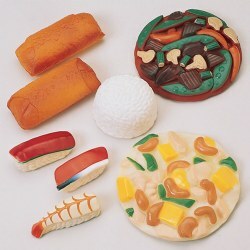 Introduce children to different types of food from around the world with this food set. All made of durable, safe vinyl. 18 months & up. 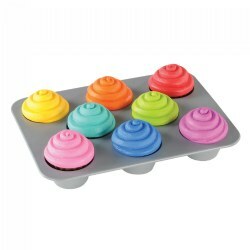 Discover the surprise shape in each of the eight colorful cupcakes. Designed for developing shape and color identification, matching, and thinking skills. Shapes include: circle, square, triangle, rectangle, oval, hexagon, star and heart. 3 years & up. Serve up delicious pretend meals for breakfast, lunch, and dinner! Young chefs can prepare nutritious food such as eggs, pancakes, fried chicken, fruits, sandwiches, and more. This set makes a great addition to pretend play kitchens. Set includes 78 pieces. Made from vinyl. Purchase all three meal sets together as one big set or buy them individually. 3 years & up. Mix and match food groups to make a well balanced meal. Each piece is made of wood, painted with beautiful detail, and boxed in a 4" x 6" wooden crate for sorting and stacking. 3 years & up. Encourage children to make healthy food choices with this set of breakfast, lunch, and dinner foods. All pieces are actual sized, washable, and come in a shopping baskets. 3 years & up. Introduce children to the different types of foods from around the world with our international foods. Kids build cultural pride and awareness as they serve up our multicultural play foods. 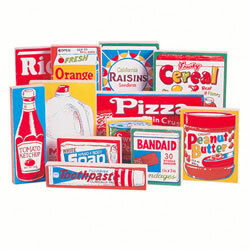 We've included authentic-looking foods made of super-durable safe vinyl. Set includes: 1 serving of cashew chicken, 1 serving of beef and snow peas, 3 different sushi, 1 mound of white rice, and 2 egg rolls. 3 years & up. 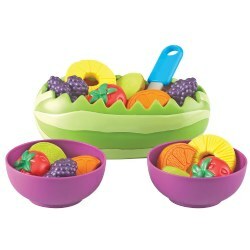 Children will enjoy making healthy choices with this combination set! 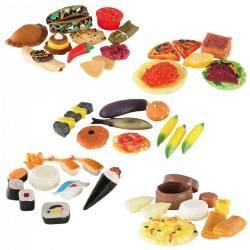 Set includes 27 fruits pieces and 28 vegetable pieces. Each set stores in a clear container. 3 years & up. 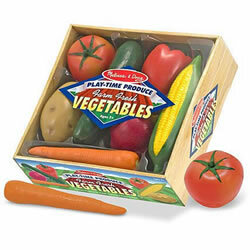 Tempting your children to try some delicious vegetables will be much easier once they have played with these realistically sized "fresh from the farm" veggies! There are 7 pieces packed in this crate of harvested seasonal favorites. 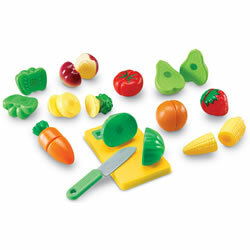 This durable, molded-plastic food is ideal for kitchen and grocery play. Crate measures 10"H x 9.25"W x 3"L.
3 years & up. Picked at the peak of ripeness, these realistically sized fruits will add lots of vitamin P for play to your child's culinary activities. 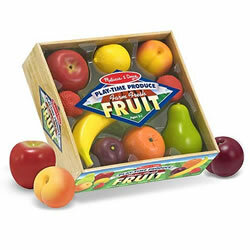 There are 8 pieces packed in this crate of "farm fresh" favorite fruits. 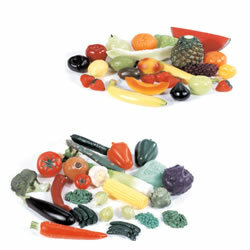 This durable, molded-plastic food is ideal for kitchen and grocery play. Crate measures 10"H x 9.5"W x 3.3"L.
3 years & up. 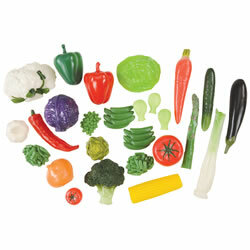 This life like vegetable set has 28 pieces and comes in a clear container for convenient storage. 3 years & up. Pizza Party! Children will delight at slicing and serving up their own pre-cut pizza. 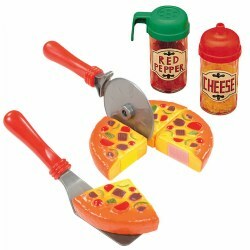 Set includes 4 pizza slices, pizza cutter, spatula, red pepper shaker, and cheese shaker. 3 years & up. 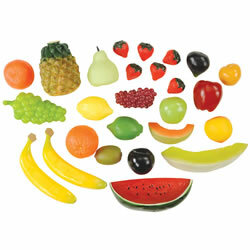 This plastic pretend play fruit set has 26 pieces and comes in a clear container for convenient storage. Contains bananas, strawberries, grapes, oranges, lemon, oranges, pears, pineapple and watermelons and more. 3 years & up. 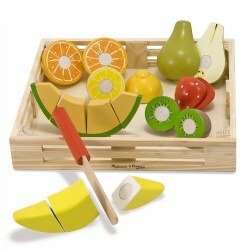 This wooden fruit set features sliceable fruit that makes a fun crunching sound when sliced. With so many pieces to cut and count, this is the ideal way to introduce concepts of whole, part, and fractions. Made using the highest quality materials and tested to be safe. Measures 2.75" x 9" x 9" packaged. Includes: 7 pieces of wooden fruit, 1 wooden knife, and 1 fruit crate. 3 years & up. 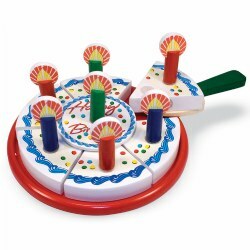 Make every day a celebration with this festive Wooden Birthday Party Cake Set! Use the serving knife to cut a piece of cake and listen for a slicing sound. Made using the highest quality materials and tested to be safe. Measures 13"H x 9"W x 1.6"L packaged. Included: 6 slices of cake, 1 cake plate, 1 server, 1 storage box, and Removable candles and toppings. 3 years & up. 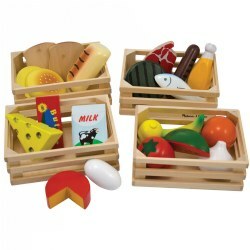 Set of 12 food and personal care items, hand painted on safe, durable hard wood for creative play in the role of grocer or consumer. 3 years & up. 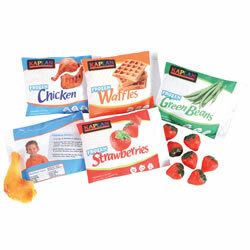 Fill your freezer with healthy and delicious play foods! Includes strawberries, waffles, baked chicken, and green beans. Each fabric bag is filled with four healthy-sized servings and contains nutritional information and fun food facts as well as a convenient velcro closure. 3 years & up. Young pizza chefs everywhere will shout "Mamma Mia!" 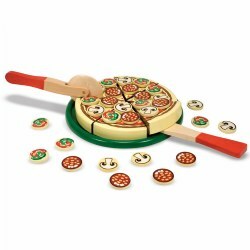 when they see this Wooden Pizza Party Set! Children will stay busy topping, cutting, and serving up custom pizza slices. Made using the highest quality materials and tested to be safe. Measures 13"H x 9.3"W x 1.6"L packaged. Included: 6 sliceable pizza slices, 54 mix-n-match toppings (pepperoni, mushrooms, and peppers), pizza pan, pizza cutter, spatula, and brightly colored wooden storage box.